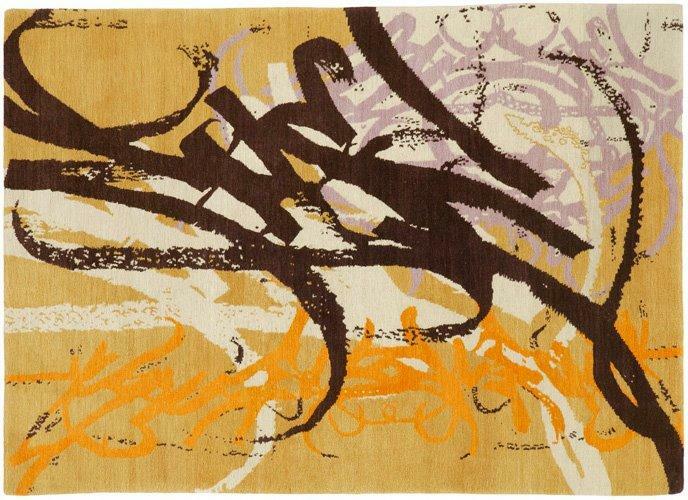 Graffiti rugs: the hidden objects? 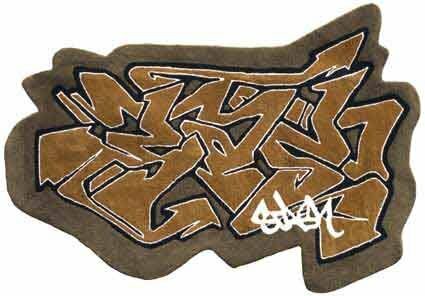 It was only a question of time that rugs would follow suit to the use of graffiti on and for everything. 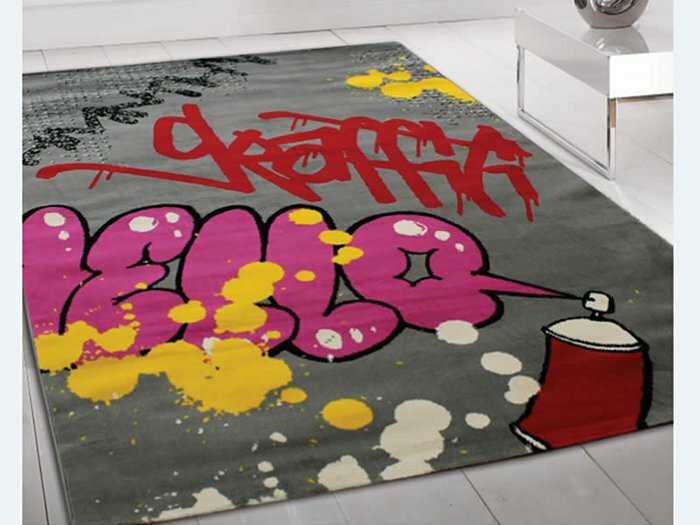 But “graffiti rugs” haven’t gained a lot of media attention even if graffiti patterns found their way into woven wool or plastic fibers in various ways by now. I just wanted to get an overview for once. 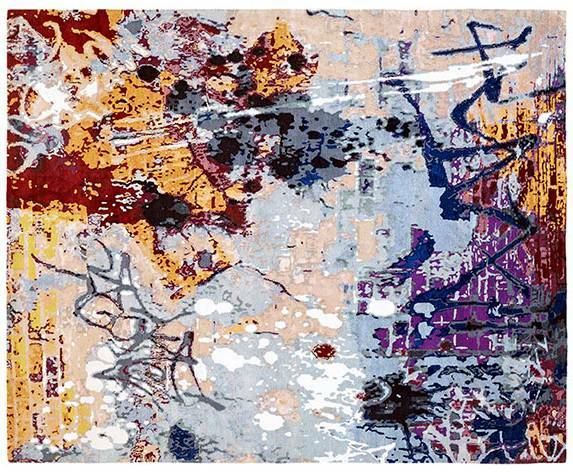 There are the established carpet companies that seem to want to refreshen their offer by including graffiti “inspired” handknotted rugs. Mostly, they do not -at least not visibly- collaborate with writers nor use explicit graffitied letters but use patterns that look like photoshoped photos they took from eroding walls. 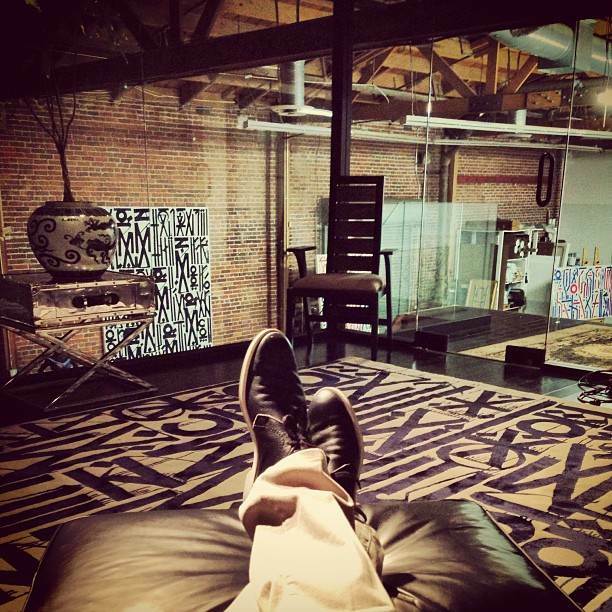 Vartian Carpets with their Urban Collection can stand as an example here. 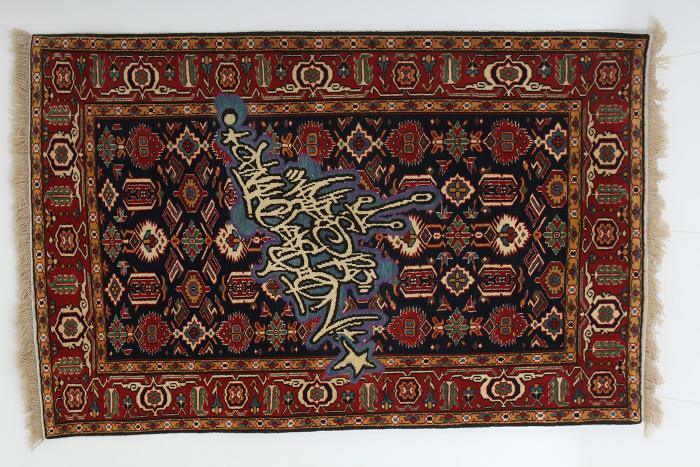 Other, younger rug dealers work together with writers to create their carpets. The general aim here seems to shaken up the traditional rug market to please more “progressive” clients. Insistence here is made on the quality of the rugs but also the innovative artistic approach. Rugged Art is a good example here. 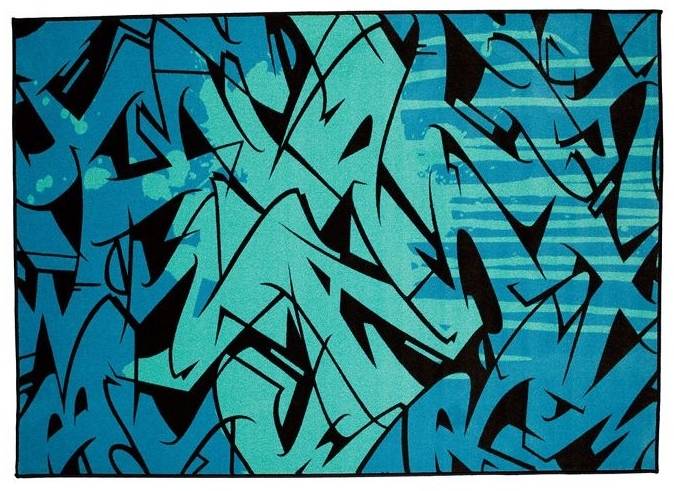 They take pride in working together with artists “many of whom have a background in graffiti/street art” for their limited edition hand woven rugs. 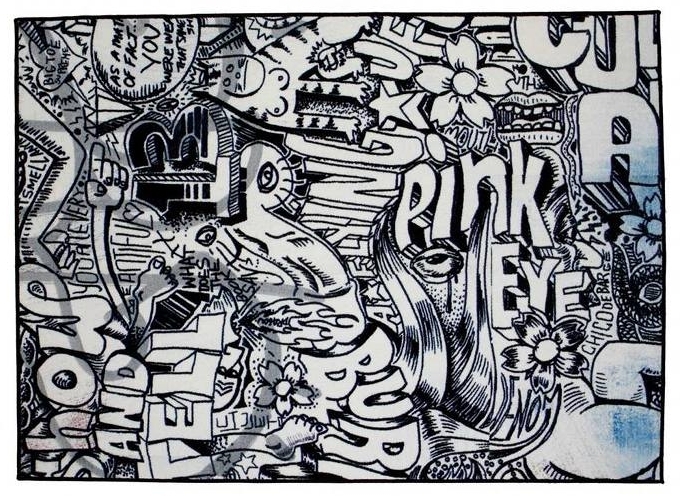 In fact, most of the artists they collaborate with have a graffiti past. 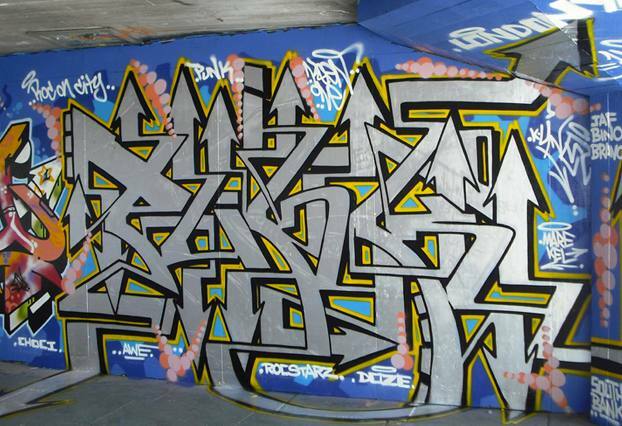 The first graffiti related collection came out in 2010, another followed in 2012. The collaborating artists like Khashayar Naimanan, Turfone, doze green, José Parlá, however don’t mention the rugs on their own sites. 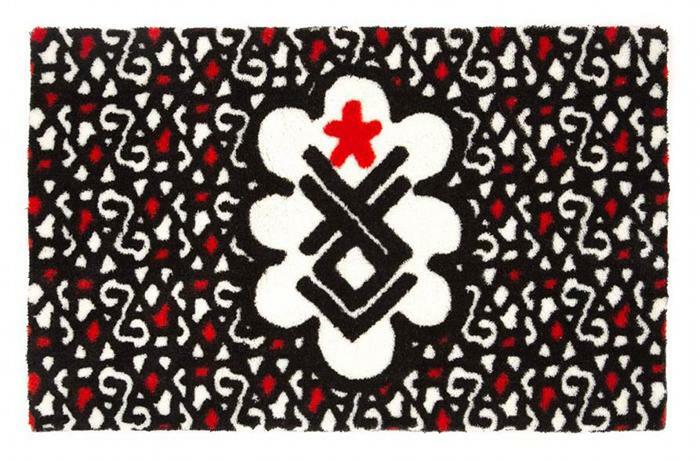 Marc Phillips Rugs also helmed a collaboration between 27ground and Shepard Fairey but also with Retna to design some rugs. 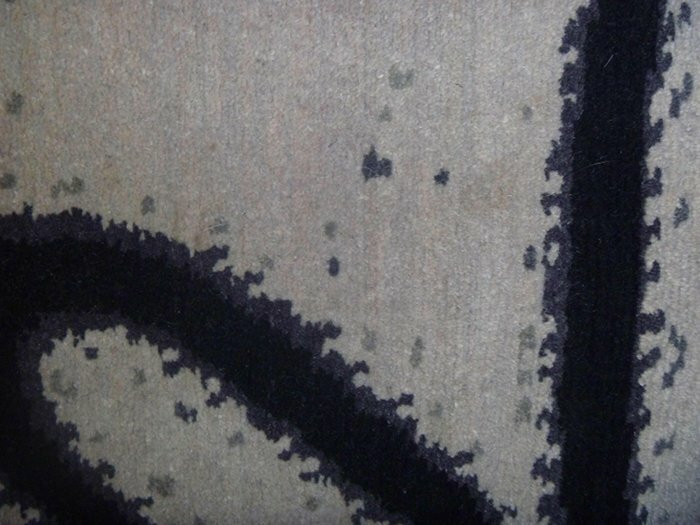 These limited edition rugs were however not designed as part of Marc Phillips Rugs conventional offer but were auctioned off without any online media outlets at a charity in spring 2013. Traces of this collaboration can be found on the 27ground blog and some photos posted by Retna and his circle of friends on instagram – the latter without however mentioning the collaboration. A similar approach is the one by Urplace who also collaborate with writers but offer more affordable carpets in a lower price range since 2013. Again, the collaborating writers like Mad C or Buster One don’t seem to mention these plastic fiber rugs via their own social media outlets. 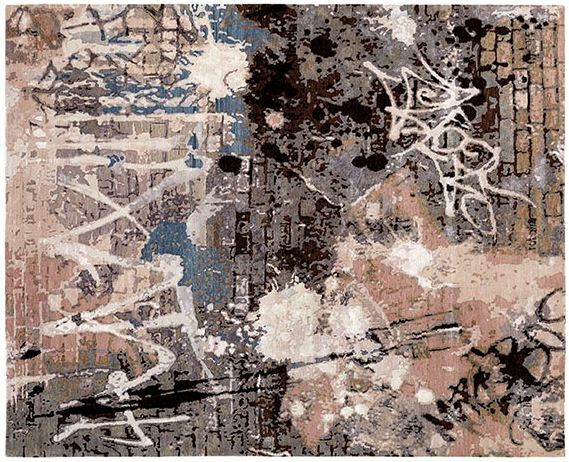 Next to official rug dealers there are designers or artists who work within a variety of media – among them rugs. 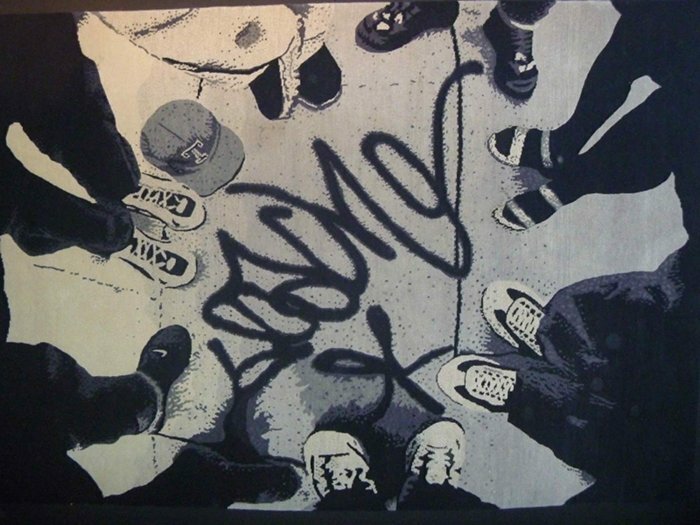 I already talked about the graffiti tapestry by Lars Erik Johannson. 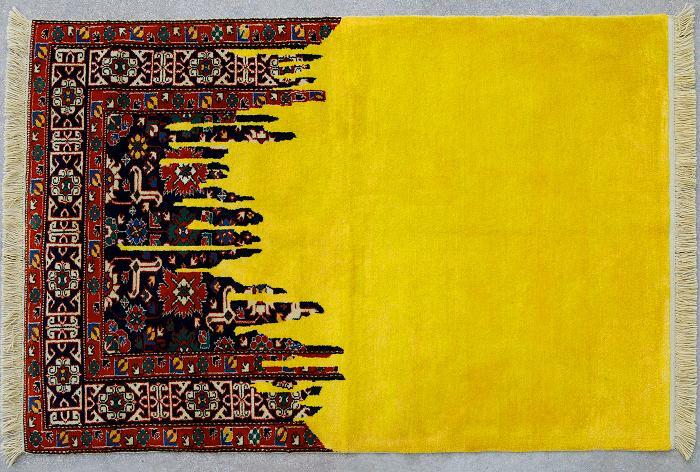 A recent addition are the rugs by Faig Ahmed that circulate on the web since summer 2013. He “studies” how to integrate “contemporary forms” (i.e. 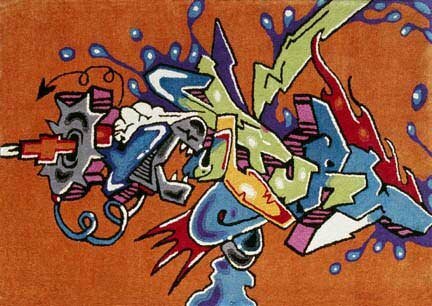 graffiti or graffiti inspired elements) into “traditional” rugs. But I didn’t find any information on where the inspiration “graffiti” comes from. Did photos inspire them? Did they do it themselves? Did they work together with someone? This grey area is quite interesting concerning intellectual property rights. Mare139 at Graffuturism uses another example of a designer as an introduction for an article that reflects on these intellectual property rights that writers own of their works. 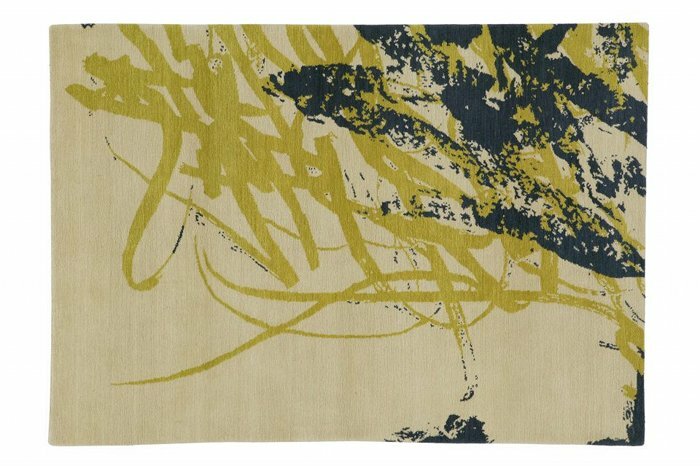 He explains how he found a piece by Keen One made into a rug by an interior designer in 2012 without the writer’s knowledge. Painted on a public wall, the designer probably assumed the property rights were also in the public domain. Keen One and the designer found an agreement when he contacted her. 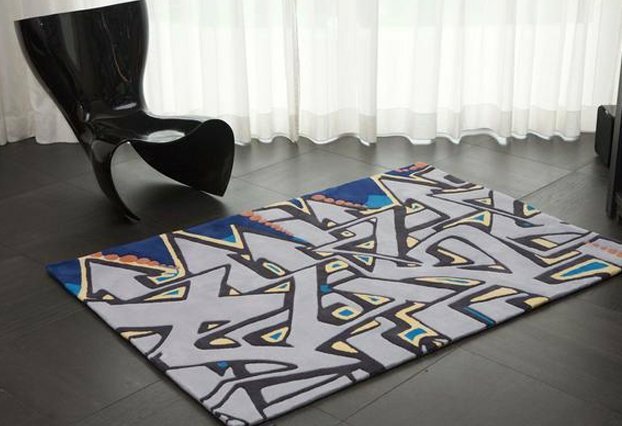 Just for the sake of being complete, all sorts of home decor online stores that sell rugs with graffiti patterns are falling more or less also into this category, I guess. The last approach that might be setting a trend is when a writer himself makes a carpet for promotional use. 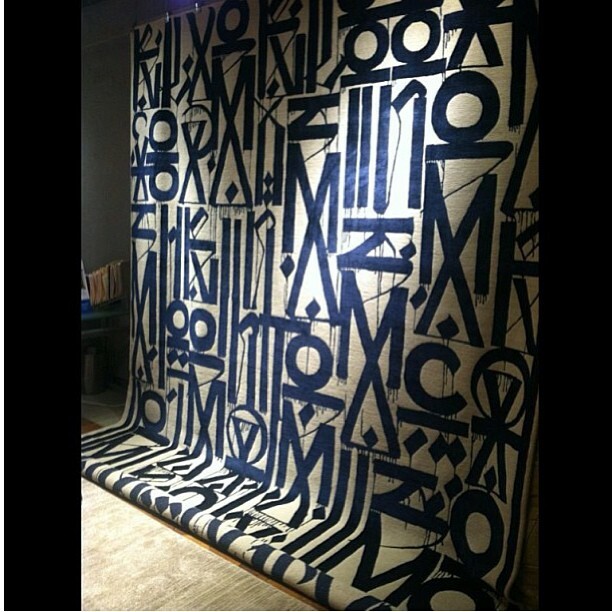 For the collaboration between Hong Kong’s FingerCroxx and Eric Haze for their 2013 spring-summer collection, they made a carpet (36x60cm) essentially used for promotional aims. It was first gifted to the attendees of a promotional event in Hong Kong and is now a gift when purchasing for more than HK$1200 from FingerCroxx. 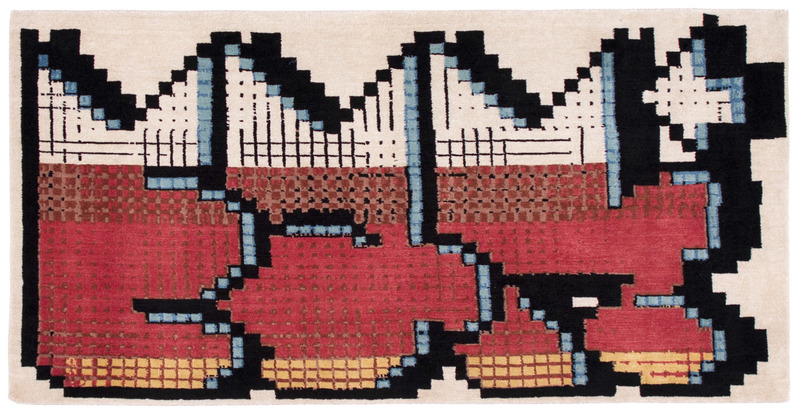 The limited edition hand-knotted wool rugs that the trading site “ToyCompany” did in collaboration with writers like Stash, Delta or Sekt in 2005 – also for promotional purposes – might count as a forerunner for these kind of collaborations.